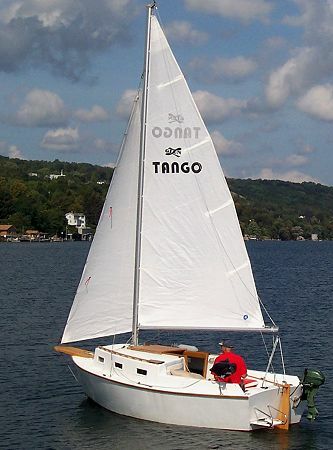 I have completed construction of the Tango and launched on April 26, 2006. Construction took 400 hours that I did over 2 ½ years. I had originally planned to have it completed a year earlier but I wanted to pay for it as I went and a couple of weddings for my kids slowed me down. Total cost of construction was about $ 6,000 not including a motor, which I already had, and trailer which I also built. The boat sails great. In winds 10 knots or less, once the sails are trimmed, it’s pretty much hands off. 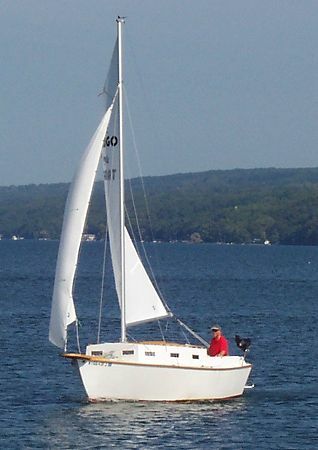 In 10 – 20 knots you’ll need to keep your hand on the tiller but it handles great. I’ve been out when the winds were over 20 knots and it still performs well but you have to keep the sails full and not sail too high. From construction to launch and sailing it has been a good experience. Although it is not the first boat I have built it is the biggest. The plans were good and easy to follow and if I had the room I would probably build a bigger one in a couple of years.